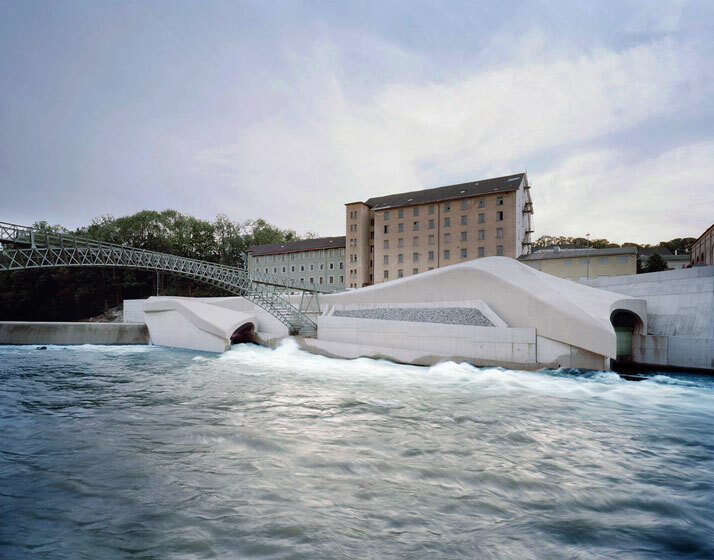 The bold, amorphous organic form appears equally placid and dynamic, as it lies on the left bank of the Iller River; the new, highly efficient hydroelectric power station replaced an older power station from the 1950’s. This amorphous colossal cement sculpture is perceived by different people in different ways; most see it as a large fish. 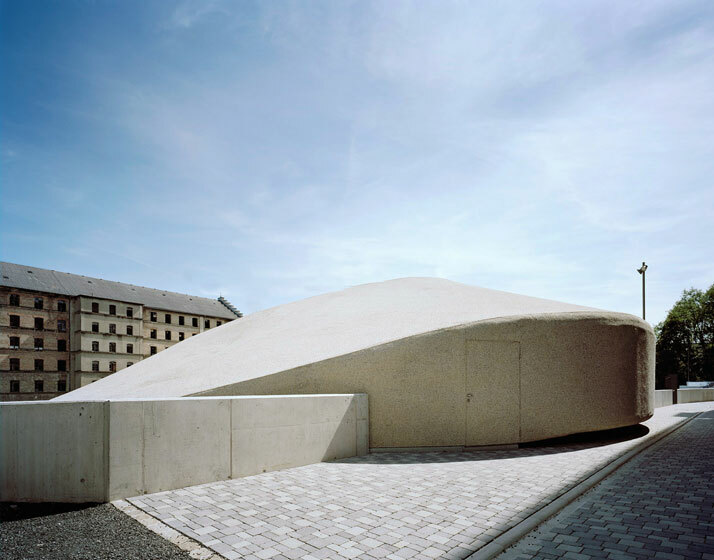 But for many it can also be viewed simply as a volume inspired by the motion of waves – as if the cement structure had taken shape as a gracefully flowing, swelling mass and then solidified. And although this category of this structure is considered industrial architecture, its sculptural form merely reminds us of it. 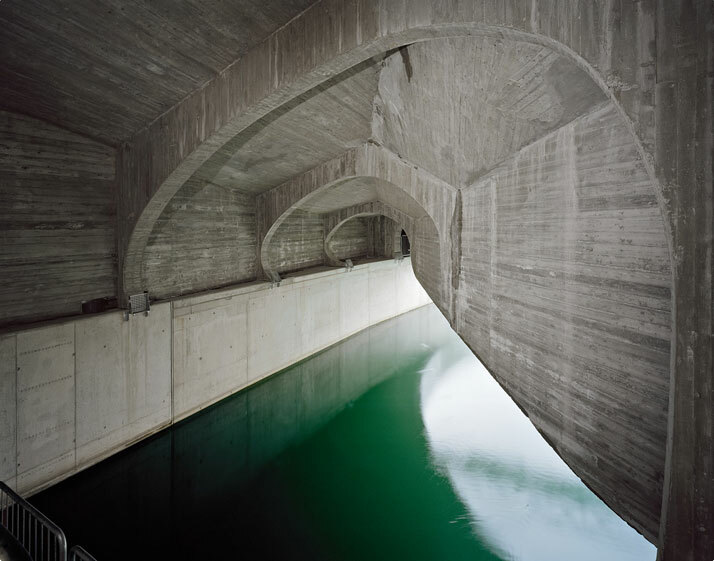 The form of this hydroelectric power station mimics and exaggerates the channelled dynamism of the water as it streams into the holding basin, down through the turbines, and back into the Iller River. 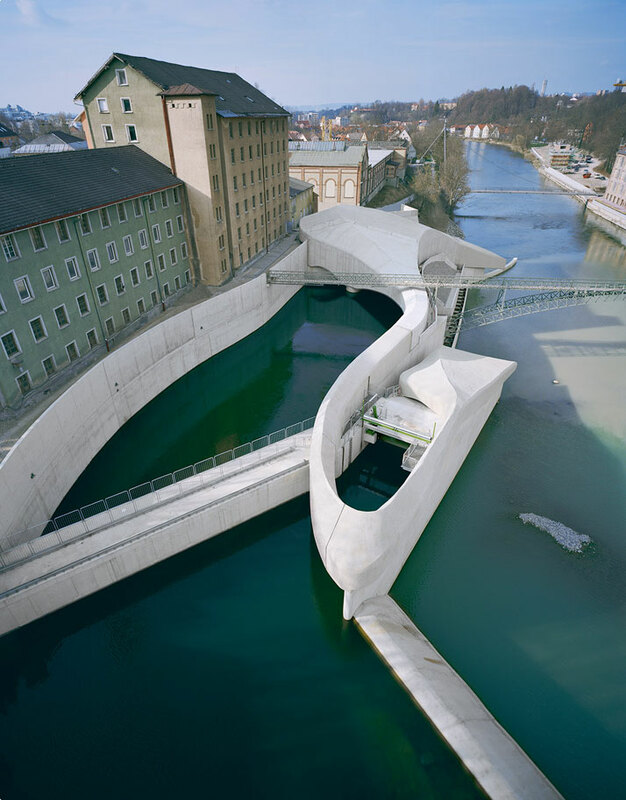 Kempten in the Allgaeu - Germany is a medieval place, at the foothills of the Alps; not a place to experiment with such forms, or so one could think; however, local architectural office Becker Architecture designed something from another world, this huge sculptural hydroelectric power station. 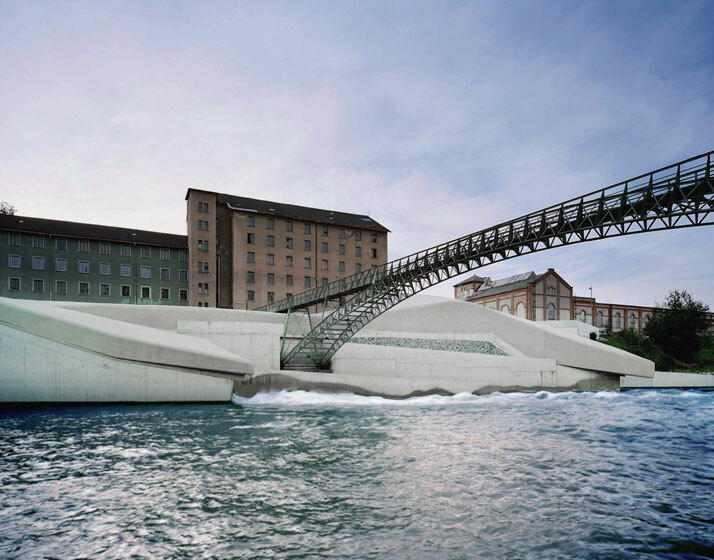 A rather bold and daring move for the medieval city of Kempten, where the 150-meter long large scale sculpture stands. 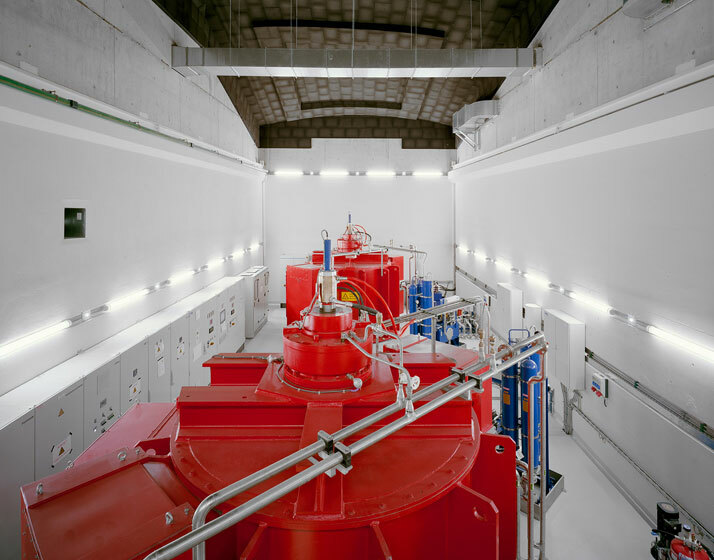 The new hydroelectric power-plant which replaced the older one now supports approximately 3,000 households with 10.5 million kilowatt –hours of environmentally friendly power per year. 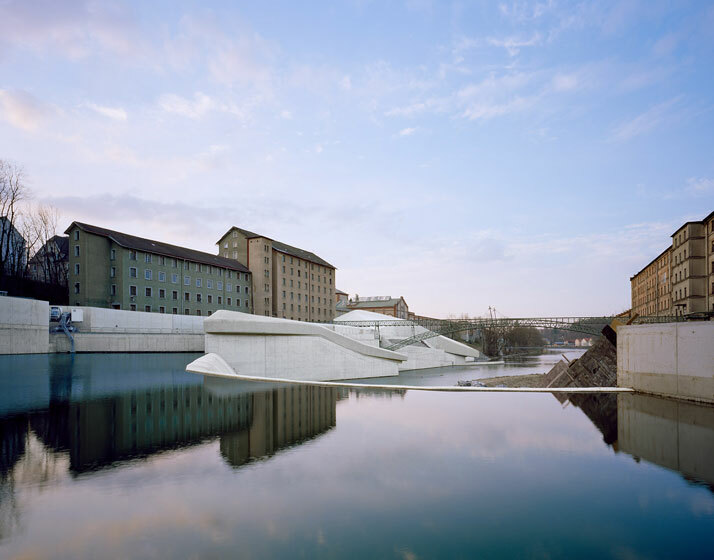 The planning of the project was nearly completed, until the authorized agency demanded a design that would fit in a delicate manner into the existing building assemblage of the former spinnery mills and the natural landscape of the Iller River. On the one hand the power plant has a very restrained visual language and puts the mills under stage, but at the same time it is self-confident and modern and the relationship with the existing surrounding environment creates an interplay, which is the strength, and the support of this design. The design given by Becker Architects may appear futuristic, but the process was entirely conventional; its extraordinary contour is the result of fifty handmade models, while its organic structure is the severe contrast to the industrial architecture of the plant. In any case, Becker Architects do not intend to render the power station or make it invisible; neither does it intend to overstate its technical power. 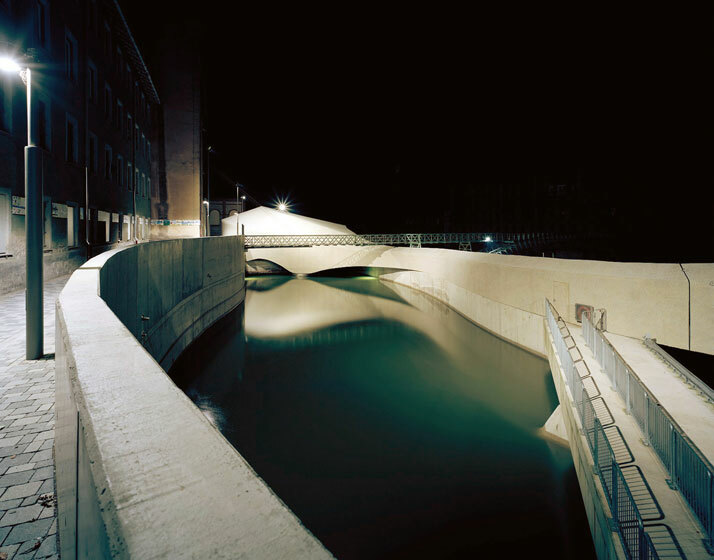 However, as a self-sufficient structure of contemporary architecture, it allows the retaining of the identity of the former industrial buildings and the river landscape, without however rejecting its own. 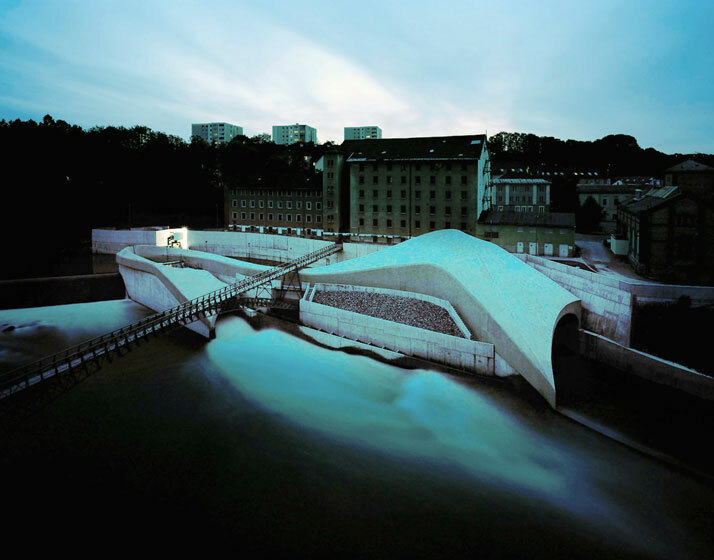 On the contrary, the sculptural structure highlights the dividing line between river and buildings, using an architectural idiom of metaphors associated with the river landscape. Appearing to be made out of soft, malleable material, it establishes a semantic link between the use of renewable hydroelectric energy and the gentle method of harnessing that energy. 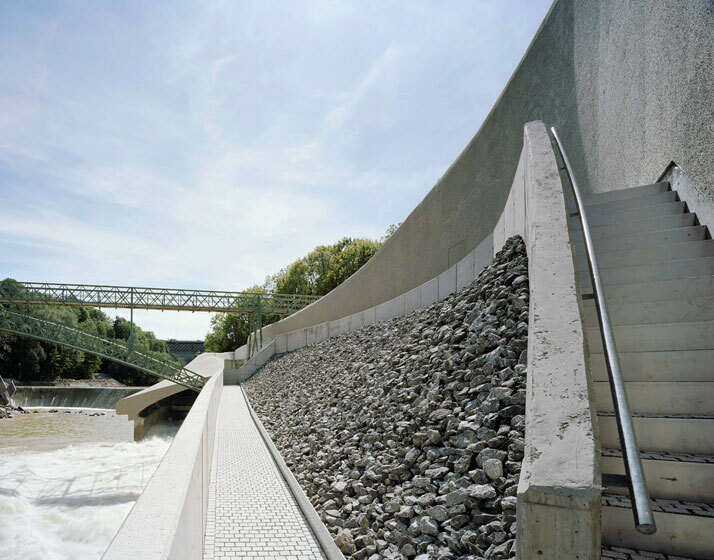 A layer of river pebbles protect the concrete from other elements and the river itself, and provide a link to the setting. The exterior skin symbolizes the rocky structure, the pebbles coming from the river onto the structure. In addition, other ecologically significant aspects were also prioritized, such as the inclusion of a fish ladder and measures to minimize the noise. 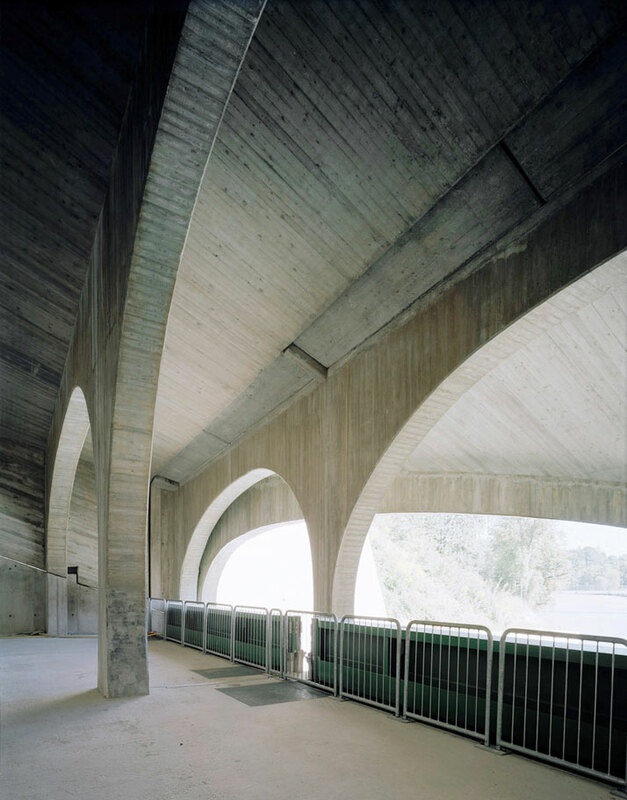 The interior is like a cathedral in raw concrete; you can see the interior like a hull of a ship or a skeleton-like formulation; consciously raw and really quite rough. Rough wooden boards were used for the interior formwork, while the exterior was spray-coated, giving the surface an almost velvety temperament well suited to its shape, steering clear of inconsiderate light effects. 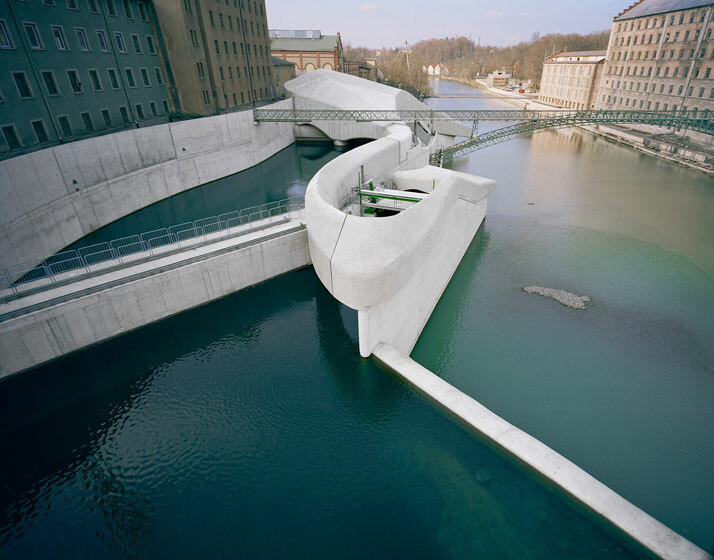 This in turn guarantees a smooth transition from the shell to the pale, fair-faced concrete walls enclosing the power station in the water. To minimize disruption of the homogeneous outward appearance, necessary openings were kept as minimal as possible. A lightweight concrete section, detachable by mobile crane if drifting debris accumulates, also fits into the overall form. This immaculate impression will not last long, however, as the structure will soon change, due to ‘natural wear and tear’ changing its appearance. However, what will remain constant is the dynamic, bold form with which the shell connects the two ends of the power station. 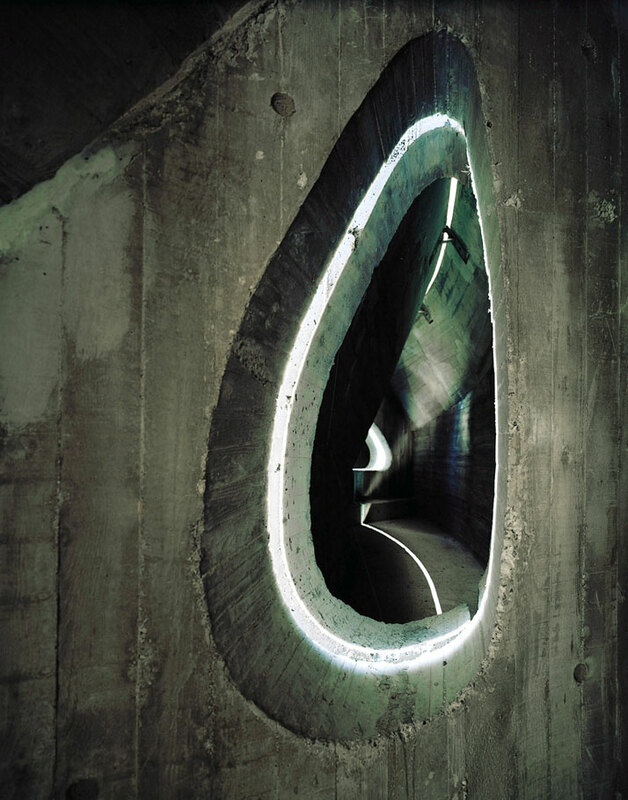 Although the exterior plays with biomorphic associations, the interior reflects the technical quality of the turbines, which are also visible. The turbine hall meets the highest sound proof standards. This is definitely due more to pragmatic than to aesthetic considerations, as the interior is far less of a public space, although guided tours are offered – an opportunity taken up by more than 20,000 in the months after the project was completed (November 2010). Afterall, the power plant is not meant to be entirely a technical building to visualize the technology, but rather an atmospheric building. The new plant will act as a sculptural centerpiece as the spinnery mills have residential re-development plans.